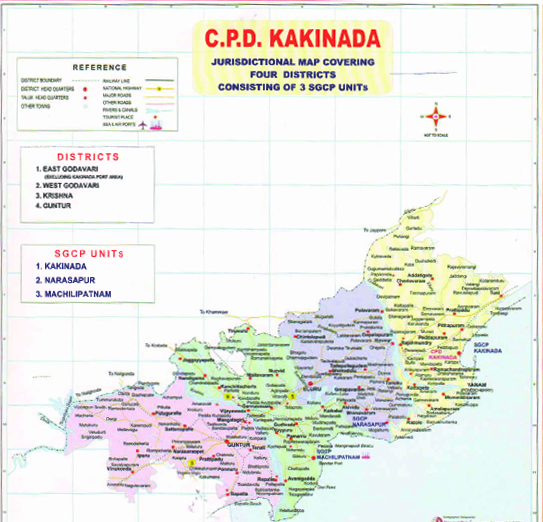 Kakinada port is located at kakinada off the east coast of India. It is 170 km (106 mi) souht of Vishakhapatnam Port. Kakinada port is a large complex comprising akinada ancorage port, Kakinada Deep Water Port, Kakinada fishing harbour and ship-breaking unit. Kakinada Ancorage Port has a century-long tradition. Kakinada Deep Water Port is an all weather deep water port, and the chennal has a depth of 12 metres (39 ft). The port can handle vessels up to 50,000 DWT. The port handled 10.81 million tonnes of cargo in 2010-11. Recently AP Govt has developed kakinada beach and it has 100 acres of land covered from port to uppdata area.